if you still need it. I would appreciate a manual too. I keep trying to send it,but I keep getting an over quota message. You might need to clean out your mail box on the server. I'd love a copy of the manual too, if you please. I received this snowblower from my in-laws and they didn't have the manual. The tire is flat and will not fill with air. i would like a copy of the manual, if available. thanks. I sent them to your email address. Sent them to your email address. I sent to them to your email address. I'm look for a manual for an older Craftsman Snow Thrower 10/29. Model number 536.886330. I need an e-mail address to send it to you. I got it (on your profile page). I know it's been several months, I was wondering if you still had an electronic copy of that manual? I inherited the machine when I bought my first house. Before the wonderful white stuff starts falling, I was going to see if the machine was working. It needs some obvious work, and I want to make sure I get the right parts. I will send you a copy of the owners manual to your yahoo address. It's a big file. Parts still seem to be available from Sears. Good luck with it. I guess there's a reason for the nickname. 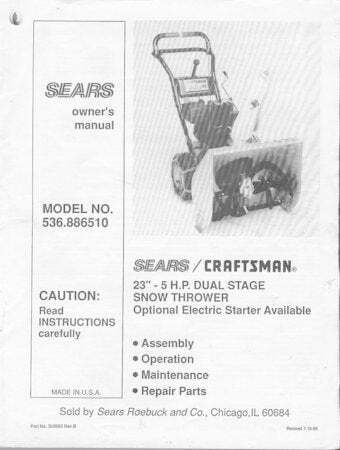 I have a sears snowthrower model # 536.886530 i would also like to get a copy of this manual if still possible. Thanks so much. It's to big to attach to this site/ email. If you give me you email address I'll send it to you. It's 28 pages. Could I also get a copy of this please. Just picked up this blower and can't find anything on it on the net. Got it THank YOu. 2 people mailed it to me so Thanks to both of you. What's your email address. The file is to big to attach it to this site. Would you mind emailing me a copy too? I sent it to you address. ohyay77, what's your e-mail adress and I'll send it to you. thanks for the emails guys, it's appreciated! I've got it now. I am another person who would appreciate a manual.Just bought a 5/23 at a garage sale and no manual.Any help appreciated. I am trying to locate a manual for this 5hp craftsman snowblower. It appears that Sears does not supports this product anymore. need an email to send it to. Hopefully this manual will extend life of this old snowblower. I sent it to your address. snjguy,Thanks for the manual. It's exactly what I was looking for. You are the greatest! Thanks for the manual it is greatly appreciated. Hey, snjguy it's snowthrower manual mania, are you having fun :) yet? Hey there, could you spare another copy of the manual? Sure must be a lot of these still around! I bought mine used and it starts first time every time on the first or second pull. I guess they were well built? Glad I can help others out but without you originally doing the scans nobody would of had this manual so most of the credit goes to you, buddy. Thanks from all of us. File is to larger for this site, send me your email address. I have been searching for this manual. could you email me the manual too? If still available, please e-mail a copy of the snowthrower manual to rcinstp@comcast.net. can i get a copy of this manual too? I actually have a Canadiana Snowthrower model that is a similar to the craftsman snowthrower...My chain keeps popping off of the gears..i think its because i just replaced the auger belt and put big chains on my tires...but not sure. Can I please get a copy of this manual. I could sure use it. Could I get a copy of this manual also? Is the "track drive" belt hard to change? The snowblower 536.886510 doesn't have tracs it has wheels so I don't think this would help you out, but I'll send it anyway. My snowblower has "trac drive" also, but everything is exactly the same as the wheeled version. Except of course the trac system. I would appreciate a copy of this manual also. I have been looking everywhere for it. Sears no longer sells it on their parts site. Thanks! The manual is for a 536.886510 not the one you mentioned, but I'll send it anyway. Hope it helps. They current do NOT have a manual for a 536.886510 but they do have one for a 536.886531 which is also a 5HP 22inch. They current do NOT have a manual for a 536.884781 but they do have one for a 536.884790 and a 536.884791 which are also 5HP 22inch. The manual I have is for a 536.886510, don't know if it's the same but I'll send it anyway. I sent a copy to the address you stated. If he doesn't get all of it get back to me. It's a large file. Thank you very much and I hope I can help somebody sometime. My traction drive is not working. Can you send me a copy of the service manual for a 5/23 snow blower/thrower? My email address is ooitsmagico@yahoo.com. Can you please email me? If anyone has a manual can you email it to me at sporterf@yahoo.com I cant get the auger to work right and was hoping that the manual would help. Please send me a copy of the snowblower manual too. Could someone please send me a copy of this owner's manual? I just purchased it and can't find anything on it anywhere. Thanks much..!! Could someone also send me a copy of the Sears Craftsman 5/23 snowthrower? I just purchased and can't find anyting on it anywhere. Thanks much..!! Thanks a million for sending me a copy..!! Please, please, please! If you have this manual, please send it to me at oliverhunley@comcast.net. sending now - did you get it before? Steveareno, any chance you can send me the manual at Ichoosehope2@yahoo.com Many thanks. Thank you to all who sent the manual for the 536-886510, thank you very much but, that's not the manual I need. I need the 536-884800, mine has the tractors as opposed to wheels. Can I please get a copy also. In need of the 536.886510 Manual. Please send to irontrax06@yahoo.com. Thanks! Can you send me a copy please? I am looking for a owners manual for a craftsman snowthrower model 536 886510.My email adress is brianjs@bresnan.net. Hey I just picked up one of these. Could you send me the manual also? One of the posts in this thread (as found by Google) states the Sears snow blower you have the manual for is the same as or similar to the Canadiana snowblower I have. It has 2 model numbers on the tag - F2350000 and 336182. Do you know if the Sears and Canadiana are the same snowblowers? Can you send me the manual at jgirard50@gmail.com? Hate to ask - but could I get a copy - you are very kind. Don't know if it's the same but sent anyway. It looks like you are the special one sent by santa. Could you also send me a copy? My address is robndenver@mac.com. Went to start it this morning for our new snow and no luck...Thanks in advance. Would you please email me the manual for the Craftsman snowblower model # 536.884810 too? Thanks a lot and have a happy new year. It's a long shot, but if anyone has an owners manual or service manual for the Bolens Winter King Snowcaster from 1962, I'd sure appreciate it. I am also looking for this or a like manual. Any help would be appreciated! Need your email address and I'll send you the manual, to big for this site. Would you be kind enough to e-mail a copy of the snow thrower manual for 536886500 or the 536886510. I have the 536886500 but I am sure the 536886510 would be close. Hey, I would really appreciate it if you could pass a copy of that my way. phnominon@yahoo.com. Thanks! I was reading there was a manual available? I cant find one online at all. If someone has one that they could email me it would be greatly appreciated.. We just inherited the 5.23 blower and can't get it going..
Can I also receive an email copy of the manual for snow blower 536.884800? My email is chris_idleman@yahoo.com THANKS!!!! I also need the Manual for Sears Craftsman 5/23 Snow blower; 536.884810. Can some send it to me as well? I don't have one for the model your looking for but I'm sending the one for 536.886510. Hope this helps. I am also looking for a manual for the above snow thrower w/ trac drive. My email address is racingbob@mchsi.com. I would truly appreciate a manual as well if its not too much trouble. My email address is matrix857@yahoo.com. Please send a copy of the sears snowthrower 536.886510 manual to me. Also looking for this. Just picked one up and would really appreciate it if someone could send it to me incase I have a problem this season. Could you please sent me a copy of the owners manual as well? My father-in-law has one but has lost the manual. Thanks! Anyway I could get a manual as well? I live in Iowa and just got pounded with 13 inches of snow with 6 foot drifts in my yard! Crazy Storm! My snowblower no longer goes forward or reverse. Hope to find a quick fix. Manual would sure help. Thanks! I need your email address, to large a file for this site. Would you also mind sending me a manual for a Sears 5hp 2-stage snowblower (536.886510) to europe505050@yahoo.com? If a 536-886510 is very simalar to a 886500? Could you please send manual to Jos24.15@usa.net. We were given a used working 836-886500 snowblower that works great. After using it hard for a couple of 10" snows the auger clutch needs adjustment. We are very happy with it and want to keep it working as long as we can. Like you I received this from a relative and I'd like to properly maintain the unit. Thank you for the manual. Anyone who needs a copy in the future..plse feel free to request it and I'd be more than willing to forward a copy. I also have the older snowblower model manual 247-886510 if you need it. looking for a manual for this model. Good call - should have left my e-mail in the first post. garydoii@verizon.net. Thanks again. We need this snowblower manual and have no luck finding one. We would love it if you could send us a copy of this please. Could someone please e-mail me this manual as well...And any idea on why the auger would stop working? My e-mail is robandrosey@sbcglobal.net, can some one please send me a copy of this manual. When you look at the auger from the front you should see two shear-bolts. If you've hit the auger or gotten an object to enter the unit the bolts will shear. You also need to provide me with an email address for the manual. I need your email address it's to large to post here. Here is the link to the manual. Anyone can download it now! Is there any way that I can get a manual for this model still? Any help would be greatly appreciated! I need a copy of this manual. Please email me a copy. I am willing to pay. Could you please send me a copy of the manual.. i am looking for the 884800, but any of them will do. Can someone please email me the manual for the above model snowblower. Thank you in advance. I need your email address, to large to post. Iceman101 has provided a link that should help you, which is below. If you have a problem then post again. But the 811 has the track drive. I would like a copy of a Craftsman Manual for a 536.884800, and a 536.886540 snowblower. My email is nwernett@ptd.net Thanks! Please send me a copy of this snow blower. My father bought it years ago and since he has passed on my mother owns it and the manual has been missed placed. Now there is a problem with it and I need it to fix it. You need to provide an email address if you want someone to send you a manual. I also would like to have a service manual for the sears snowblower 536.884810 I have a problem with my snow blower. It worked all winter now it will not move when I engage the tracks. check page 30 of the pdf... motor mount assembly. If you got the service manual please send it to me. What's your email address , I'll send it to you. I need a manual for an older craftsman trac snowblower model # 536.884810. Tracs only move when running. I have the 5 HP 23inch Trac-Plus which is model 536.884811 if you want that manual email me and I'll send. It's that time of year, another 2 hrs and mine will be done! I have the manual for 536.886510 which is a 5hp/23", but Sears made many models that size. I can email you the one I have, it might help. I need you email address. Gunnar you have to provide an email address ether on the board or in your profile. I would like a copy of the manual for Craftsman Snowblower model 536.886510. Please email me a copy. lcfaust@hickorytech.net. Thank you. Could you please email the manual to me as well? I also need a manual for this snow blower. I am looking for a carburater rebuild kit, does anyone know where I could getmy hands on one? can you send me a copy on the manual Please! Does anyone have a digital copy of the owner's manual they could send me? If not the same model number, perhaps a copy of one similar, 5 HP, 10/23, track drive snowblower. sorry, it didn't add my model- #Model #536884810 5hp 23"
Would one of you be kind enough to send me a manual for this model? I've been working on mine for awhile now. I replaced the fuel line and want to make sure the fly wheel is in the right place before I put the recoil pulley back on. I know - a mechanic I'm not! Here is a picture with the flat magnet at the top.